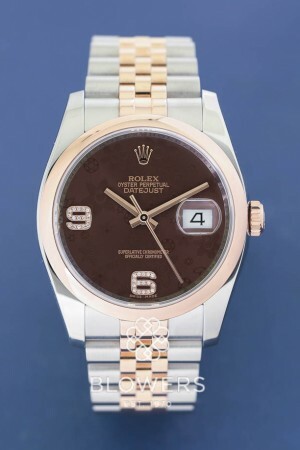 Rolex Oyster Perpetual Datejust 116201. Automatic chronometer movement. 36mm diameter steel case, which is water resistant to a depth of 100 meters. Rose Gold domed bezel. Bronze floral dial with diamond 6 & 9. Steel and Rose Gold Jubilee bracelet with concealed clasp. Box and papers dated January 2014. SKU: 3009168. Categories: Datejust & Date, Gents, Rolex.